Some people notice an increase in feelings of hunger after they start to take vitamins. Although some vitamins may affect hunger in certain situations, these increased feelings of hunger are more likely due to another cause. Under normal circumstances, adding vitamins to your daily routine shouldn't increase your appetite. If you notice your vitamins are making you extra hungry, it may be due to another cause. Taking a daily multivitamin shouldn't make most people feel hungry. In fact, a study published in the British Journal of Nutrition in May 2008 found that women who took multivitamins had fewer feelings of hunger than those who didn't. So if you start taking a multivitamin regularly and then notice you seem to be hungrier than usual, consider other potential reasons for these increased feelings of hunger. 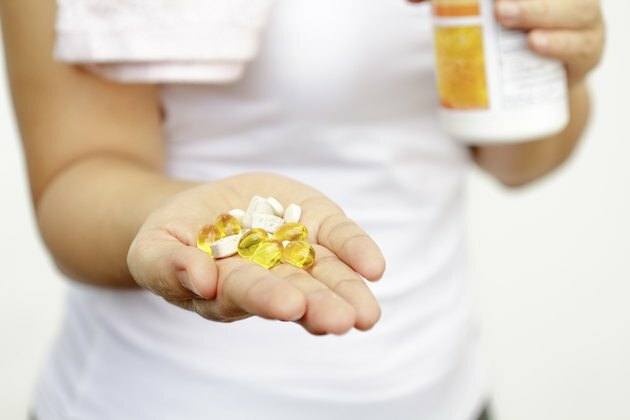 Although most vitamins won't cause you to feel hungry if you're healthy, people with certain conditions may experience and uptick in hunger when they start to supplement. One of the side effects of certain vitamin deficiencies is a loss of appetite. If you have such a vitamin deficiency and then begin taking vitamins to correct it, you might feel hungrier because you're no longer experiencing a loss of appetite because of the deficiency. People who lose their appetite due to cancer may experience improvements in appetite with the administration of high doses of vitamin C, according to a study published in the Journal of Korean Medical Science in February 2007. A study published in the journal in vivo in 2011 found that vitamin C improved symptoms of nausea and loss of appetite in people with breast cancer undergoing chemotherapy or radiation treatment. Loss of appetite is a side effect of vitamin B-12 deficiency, which is more common among vegans, chronic alcoholics, people with digestive disorders and those who've had weight-loss surgery. Folate, like other B-complex vitamins, helps turn the food you eat into energy and is important for a healthy metabolism. A deficiency of folate can cause loss of appetite. A study published in Nutrition in 2014 found that folate supplementation may improve the appetite of preschool children. Among the other B vitamins, thiamine, niacin and biotin deficiencies can also cause lack of appetite. Vitamin D's effect on appetite is interesting, as both vitamin D deficiency and vitamin D toxicity can cause appetite loss. A vitamin K deficiency, which is most common in people on certain medications or those who have difficulty absorbing fat, may also lead to loss of appetite. Some people start taking vitamins in an effort to be healthier; at the same time, they increase their exercise or go on a reduced-calorie diet, either of which could cause them to feel hungry. Check with your doctor to make sure you don't have a more serious medical problem, as diabetes, hyperthyroidism, low blood sugar and Graves' disease can also increase hunger. Certain medications, including antidepressants and corticosteroids, may increase hunger as well.